How is your teaching voice? Your teaching voice is the one you use when you're standing in front of your class. It's your professional voice and often different in quality from our day-to-day speaking voice. So, how is your teaching voice? There is reason behind my question. Even if you're now a teacher by profession, I'm sure you can remember the experience of listening to a teacher with a poor or weak voice. Perhaps they droned. Or may be the voice was shrill or harsh or too loud. That teacher may have been an expert in their subject but their voice didn't communicate in a way that inspired you to want to know more. If that happens when we're adults we may politely day dream - focus our attention inwardly and wait for the talk/lesson to end. However, if it's children in a classroom, their response is likely to be less restrained. They will whisper, pass notes, yawn, and prompt the class clown to entertain them with diversionary tactics. Do you know what affect your teacher's voice has? If you know your subject, have prepared your lessons carefully to meet the needs of your students and are still having difficulty maintaining attention, it might be time to consider your voice. There is nothing to lose and a lot to gain. I promise you the exercises are fun and easily learned. When I did my teacher's training years ago, we were taught nothing about voice. 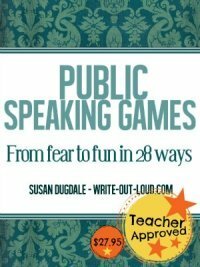 The little knowledge I had came from speech and drama tuition, something I had actively sought out for myself but there was no help or guidance for my fellow teacher trainees. The result was ignorance. They didn't know enough to know what they were missing out on. Thankfully, that is changing. We also know that the major components of communication (effective and non-effective) are a combination of what you say (the words) and how they are delivered. "Most individuals are unaware of the static they create when they communicate. What do I mean by static? Static is created when what you say is inconsistent with how you say it. 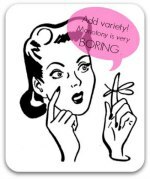 For example, suppose you’re having a conversation and the other person says, in a boring, monotone voice, “I’m so excited to have this opportunity to work with you.” Their facial expressions are lifeless. They never look you in the eye while they’re fidgeting with a pen. Most likely you’d question their credibility and knowledge, and not take action on what they have to say." What does this mean for the teacher's voice? In a nutshell it means that what you do with your body while you explain the lesson is as influential as the words themselves. If you want energized, focused, actively listening students then you need to mirror that in your actions. The trick is to SHOW while you are TELLING what you've got to share is exciting, relevant and important. This cuts through the "static" Stacey Hanke is talking about in the extract above. Our body, tone of voice and words must match. Some people achieve congruence of body language, tone and words intuitively. They are the performers who know how to hold an audience's attention effortlessly. Others of us need to learn consciously. In case you are tempted to judge yourself harshly; it is not a question of better or less than but merely one of difference. In fact, often the person who learns these skills consciously has more control and flexibility once they've mastered them. Why? Because they can stand back from themselves, analyze their results and adjust accordingly. The person who just 'does it' often does not have an overview of their behavior. A great start to re-energizing your teaching voice is to understand body language. This page offers a basic overview. I'm sure once you've read it you'll realize you know most of it already. What you may not have consciously understood though is that you have the power to choose what story your body language tells. Even though the page is an elementary beginning, you'll find enough to start experimenting with how you deliver your lessons. Your next step is to look at vocal variety. A teacher's voice needs to reflect passion but more than that it needs flexibility. This means having a wide variety of tonal expressions and other skills to select from. You can find exercises to develop vocal variety here. Rest assured they are fun, easy to learn and EFFECTIVE! Do you know the trick of using the power of the pause? Timing is the key. Silence can speak louder than words. Find out about pausing for emphasis. Perhaps you need exercises to slow your speech down? 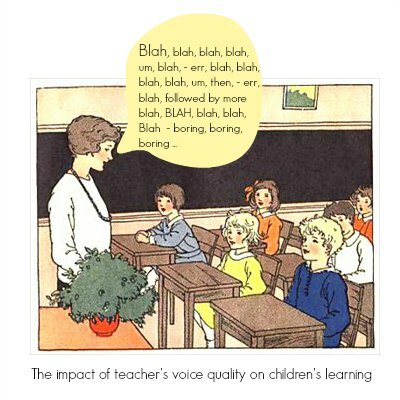 A teacher's voice rattling off its information at high speed will lose many students quickly. There are exercises for developing a flexible speech rate here. Fast is one option. Give yourself some more. Do your students have difficulty clearly hearing your words? 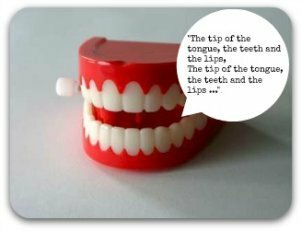 If you habitually speak without sufficient articulation, there is a page of fun tongue twister exercises here to help. How you breathe underpins voice quality and health. Good breathing and postural habits are essential for maintaining your voice. Do read and then practice these breathing exercises. You'll find not only will they improve the quality of your voice but tension will fall away as well. Yes, there is a lot to learn but these pages are a great start. Your teaching voice IS important. It's the vehicle for transmitting your knowledge, your passion, your concern...in short all the things that made you excited about becoming a teacher in the first place. Go well. Have fun developing your voice. Remember you're never just a teacher, you are a motivational speaker! If you have specific & ongoing voice health issues, please be sure to check out my voice health page. Get help before you actually need it. 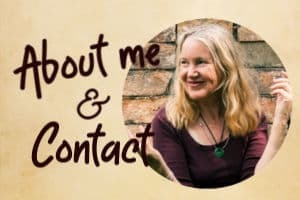 And if you'd like more on how the quality of our voice impacts on how others perceive us check this page on voice image.